Thailand's Prime Minister Abhisit Vejjajiva defied the demands of his opponents Monday morning, telling the country in a televised statement that he would neither resign nor dissolve the House of Representatives, as tens of thousands of red-shirted demonstrators laid siege to the army base where government and security officials are monitoring the protests. "I cannot answer the demands of the protesters," an outwardly calm Abhisit said during the televised press conference as he was flanked by leaders of the parties that form his coalition government. "I have listened to the protesters, but I also have to listen to other groups in society who want the government to go on." Despite the show of unity by coalition partners and the government's confidence that it can manage the protests that swelled to 100,000 this weekend, Abhisit's ability to outlast the demonstrations is unclear considering the potential volatility of the situation. By late Monday afternoon, an army spokesman said four hand grenades had been launched from pickup trucks at Bangkok's main army base. Abhisit has already invoked special security laws and 30,000 troops have been posted to the capital to maintain order. Government spokesman Panitan Wattanayagorn said that some red shirts want to provoke the military into responding with violence so the majority of the public would turn against the Prime Minister. "I wouldn't predict the outcome," says Chris Baker, a Thailand-based political and economic analyst. Abhisit assured that the army would not use force against the demonstrators, while urging them not to break laws. He accused protest leaders of trying to incite their followers by playing a doctored tape in which Abhisit supposedly told military leaders to shoot demonstrators during disturbances last April. Abhisit's government came to power in December 2008 in a coalition that was reportedly stitched together with help from military leaders. Meanwhile, outside the 11th Infantry Regiment headquarters in northern Bangkok where the Prime Minister has been working during the protests, demonstrators arrived on foot and by pickup trucks, cars, buses and motorcycles today. Troops in black riot gear stood guard at the gates as the military played music composed by King Bhumibol Adulyadej over loudspeakers. The 82-year-old constitutional monarch is regarded as a unifying figure in Thai society, but some opponents of the red shirts have questioned the demonstrators' loyalty to the crown. The protesters had been marching since early morning from the old quarter of Bangkok several miles away, where some 100,000 of them had gathered Sunday evening to demand Abhisit call a new election. As they marched, they were cheered on by workers who migrated to Bangkok from rural areas, and ignored or looked at with disdain by middle-class residents of the capital who fear a repeat of the violence the demonstrators wrought during a similar protest last April. 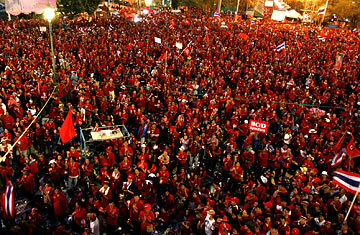 The protesters comprise mainly rural poor who seek the return of Thaksin Shinawatra, a former Prime Minister ousted in a 2006 military coup. Thaksin has been living in self-imposed exile rather than serve a two-year prison sentence on a corruption conviction. In late February, the Supreme Court confiscated $1.5 billion of his assets, ruling that he had gained them through abuse of power while Prime Minister. Thaksin remains popular with the rural poor, who regard him as the only Prime Minister who addressed their problems. His universal health care and microcredit programs were labeled as progressive by supporters and populist vote-buying by detractors. But the protesters, operating under the name the United Front for Democracy Against Dictatorship (UDD), and called the red shirts for their garb and flags, also contain groups who oppose military intervention in politics, some members of the business élite who benefited under Thaksin's rule and some republicans who want an end to Thailand's constitutional monarchy. Opinion polls from the ABAC and Suan Dusit survey centers, however, consistently show that the majority of Thais want all political street demonstrations to end. And in Monday's Bangkok Post, Pornsil Patcharintanakul, deputy secretary general of the Thai Chamber of Commerce, was quoted as saying, "We strongly disagree if the government bows to the protesters' demands and dissolves the parliament, as all efforts to recoup the fragile economy would be back to square one." Thailand's recovery from the world recession has recently picked up steam, with Finance Minister Korn Chatikavanij garnering the Finance Minister of the Year Award from British-based magazine the Banker. But farmers have been complaining that rice prices have been falling and that they have not been benefiting from the recovery as a result. After delivering his speech, Abhisit departed in a helicopter to observe the demonstration's effects on Bangkok's notoriously bad traffic as the capital braced for the night ahead. By Monday afternoon, protesters were heading back to the main rally site in Bangkok's old quarter, where the leaders were set to meet and plan their next move.